Today: Good cheese is an investment -- protect it. When it comes to cheese, sometimes our eyes are bigger than our stomachs. Ideally, you shouldn't buy more cheese than you can consume in a few days. However few of us have a strong enough will to resist the jewel-like beauties of the cheese aisle, despite their often hefty price tag. One thing's for sure: if you're dropping a bundle on some curdled milk, you better make sure to keep it as fresh as possible for as long as possible. First thing's first: steer clear of plastic wrap. This may come as a surprise, especially to the vegetarians in the room, but cheese is actually a living thing. It sweats. It ages. It even breathes. When cheese is wrapped in plastic wrap it can no longer intake oxygen -- in short, it suffocates, resulting in an amoniac flavor and possibly even harmful bacteria. As self-professed "curd nerd" Jake Lahne of Serious Cheese explains, plastic wrap can also cause the cheese to taste like, well, plastic. Which is not the flavor you were hoping for when you invested in a $15 hunk of funky Scharfe Maxx from the cheesemonger. So if your cheese was wrapped in plastic at the supermarket, free it from its bonds as soon as you get home. Because you know better. Next, we wrap our own way. If plastic wrap is a no-no, what should you wrap your cheese in? The overwhelming consensus is: cheese paper. This specialty item allows the cheese to breathe, but also protects it from drying out. 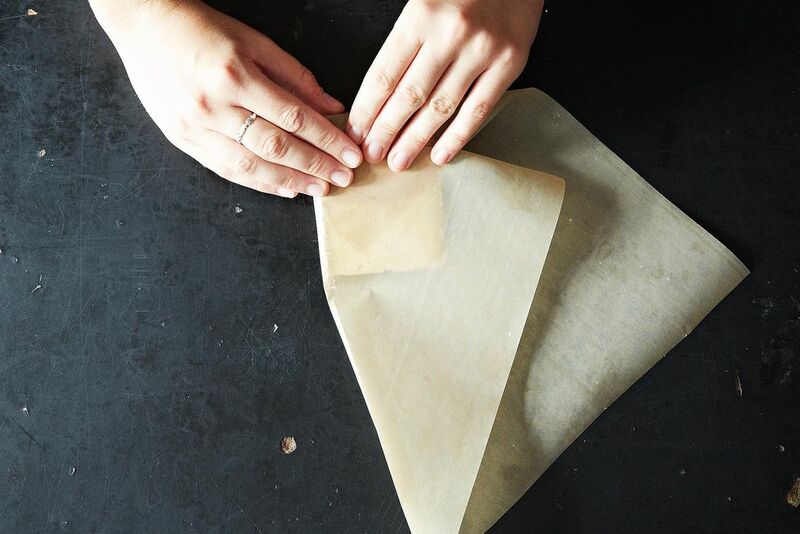 If you don't want to invest in cheese paper, parchment paper (which we went with) works just fine. Assemble your tools: cheese paper (or parchment paper), scissors, masking tape, a marker, and, of course, the cheese in question. It's time to wrap. Cut off a large square of wrapping paper -- we recommend it be 2 to 3 times the size of your cheese, just to be safe. Place your cheese diagonally with the thicker end at one corner and the thinner end pointing toward the center. Fold the corner over the fat end of the cheese. Crease. Flatten the paper along one side, as you would do wrapping a present. Pull the side you had flattened tightly across the cheese. Crease. Repeat this process on the opposite side of the cheese, being sure to keep the paper pulled tightly. Crease the tail sticking out from the end of your cheese. Pull it up towards the thicker part of the cheese. Ta-da! 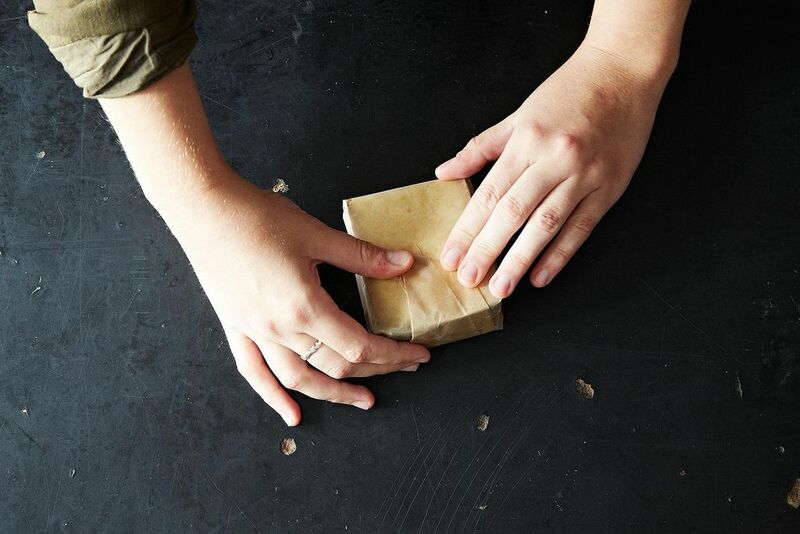 Tape the final flap to secure your beautiful, secure cheese package. 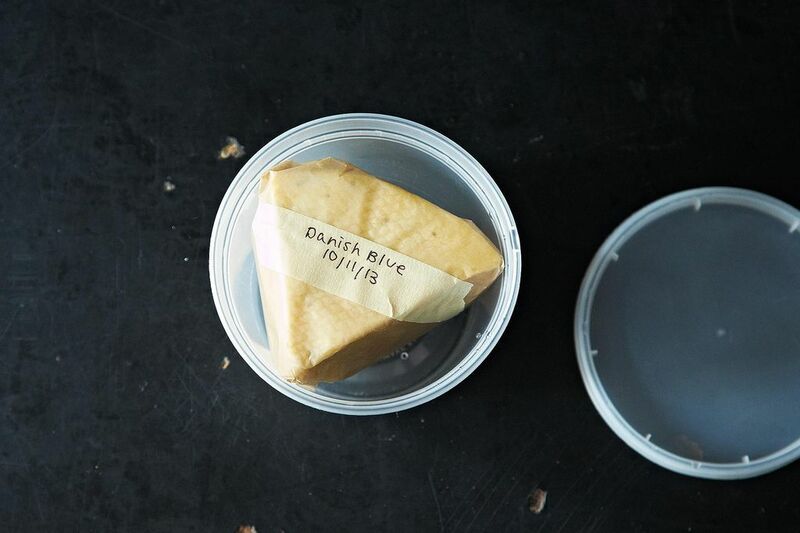 Make sure to write the type of cheese, as well as the date on which you purchased it, on the tape. That way you can tell what's what without unwrapping, and can keep track of how long it's been sitting in your fridge. If you're still feeling iffy about your wrapping skills, watch this handy-dandy video. 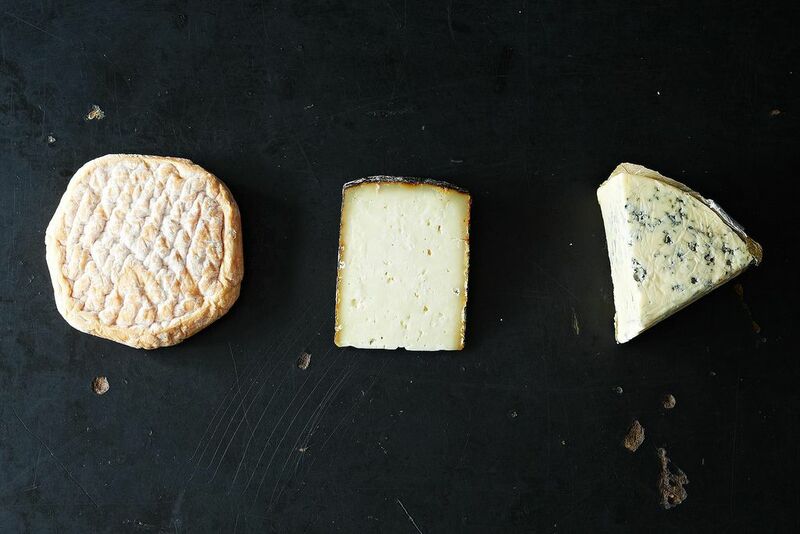 Hard cheeses should be true to their name, but you still need to be able to cut it. Tami Parr of The Pacific Northwest Cheese Project says that from the moment the curds are separated from the whey, your cheese begins to dehydrate. Refrigerators accelerate the dehydration process. To help your firmer cheeses retain moisture put them inside an open plastic bag after they're wrapped. This should help keep the cheese from becoming an unappetizing rock while still allowing it to breathe. You can also wrap the whole thing loosely in plastic wrap, as suggested by Nora Singley of The Kitchn. If you love blue cheese, you really love it. You love the pungent, acrid explosion that floods your tongue upon first contact, and then slowly mellows into a creamy backdrop. You also apparently love "karaoke, swing dancing, and shouting 'WOO HOO' when you're having fun." If you love your blue cheese, you've got to store it properly -- and keep it away from your other cheese, who might not love it as much as you. Blue cheese is kind of a flavor hog. It knows it's got the sharpest taste around, and if you're not careful its flavors will infuse your more-mild specimens. To avoid this wrap your blue cheese in the same manner as above (you can even double-wrap to be extra safe), then store it in a plastic container. This is where things get a little sticky. Remember when we said never to wrap your cheese in plastic wrap? Well, here we contradict ourselves a bit. Because when it comes to softer, creamy cheeses -- like a lovely, gooey, stinky brie or camembert -- people are in a bit of a disagreement about how to keep them at their peak. Some, like Eat By Date, argue that wrapping softer cheeses in plastic wrap helps prevent them from drying out. Others, like the folks at Beecher's Handmade Cheese, opt for paper. In the end, if you decide to go the plastic route, just make sure to change your cheese every couple of days. Very soft cheeses, such as ricotta or mozzerella, should be stored in its natural liquid in a plastic container. Watch it carefully because it will not last as long as some of its firmer cousins. More: Let's make a cheese plate. 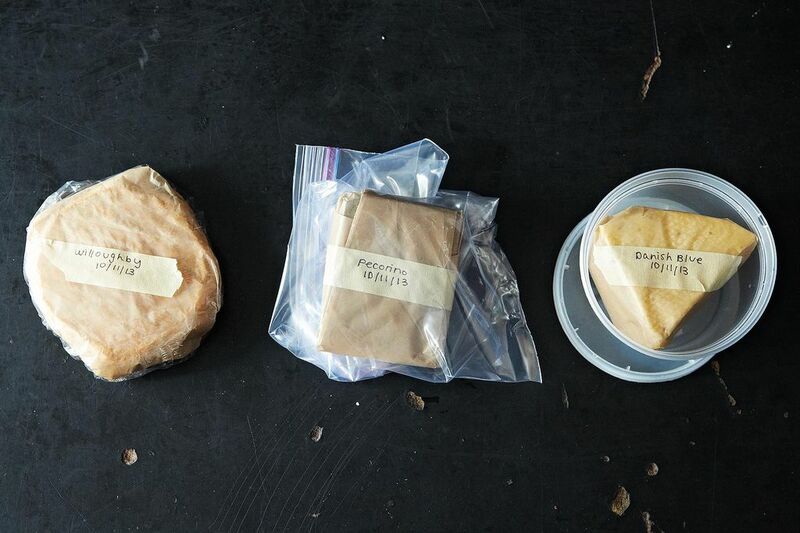 Now that your cheese is wrapped up pretty, where should you keep it? Real Simple advises to store wrapped cheese in a crisper in the fridge, which will have the most consistent temperature and humidity. If you're a true fromage fiend, devote a whole drawer of your fridge to cheese -- and then invite us over for a cheese party. More: Need to clean out your new cheese drawer? Make these cheese snacks. If you unwrap your cheese and are surprised by something fuzzy clinging to its surface, don't panic. Just cut it off and continue munching; unless it's on a soft cheese in which case it may be past its prime. Trust your instincts -- if the cheese looks or smells off, it probably is. Don't freeze cheese! It will muddle the flavor and texture. However, if you're just using the cheese for cooking, freezing is kosher. 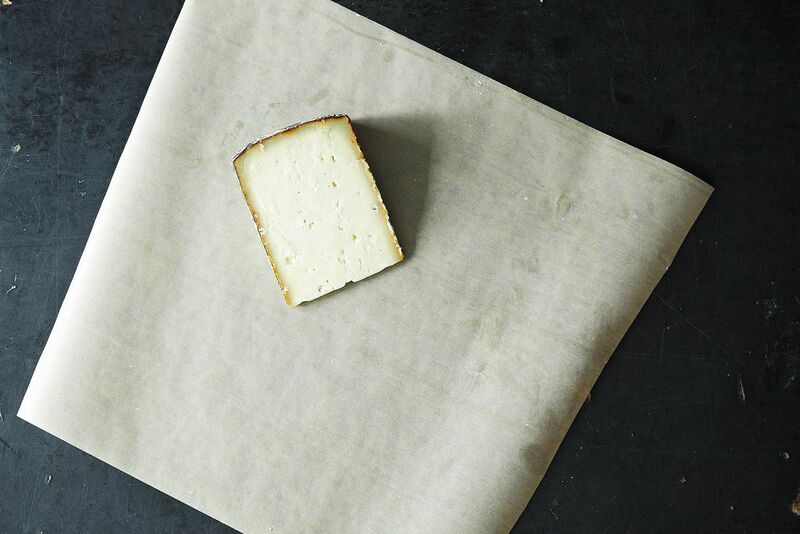 If you take out your cheese for a cocktail party or for a late-night snack, be sure to re-wrap it in fresh paper. In the end, your cheese is a living, breathing thing. Treat it like one, and it'll treat you back. Wouldn't waxed paper or parchment paper work as well? I used plastic wrap on my cheese for years, found it went mouldy fast. I now use wax paper along with tin foil. 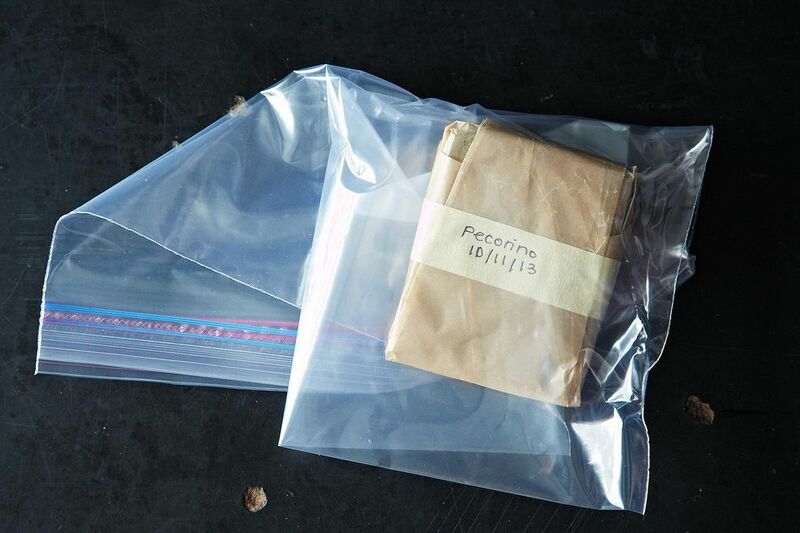 I think I will try the parchment and see how that goes. 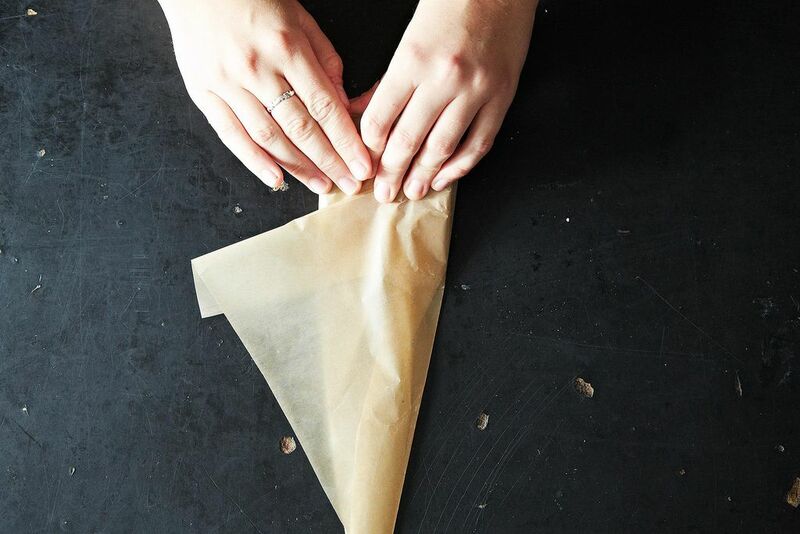 So all these many, many years I've wrapped sandwiches and alike in waxed paper my technique was all wrong! Who knew.........cause they never got stale and were for sure far easier to wrap than cheese. I use this for cheddar, swiss, monterey Jack and similar types of cheese. Strangely enough I use a semi loose ziplock bag, put the cut cheese in the bag, throw in 3-5 sugar cubes (it must be the cubes NOT the equivalent amount of regular sugar) and seal bag. Use the cheese as you want it, check on the sugar cubes when you return the cheese to the bag. If the sugar cubes are getting soft or starting to break down from the moisture, clean out bag (of the sugar) and replace sugar cubes with fresh ones and put the cheese back in. Give it a try, you will be pleasantly surprised. I'd buy it in a heartbeat! Thanks too for the cheese wrapping lesson. we used one when we lived in France and it worked great plus it requires no additional paper wrapping. I've been using parchment-lined foil. Eliminates the need for tape. 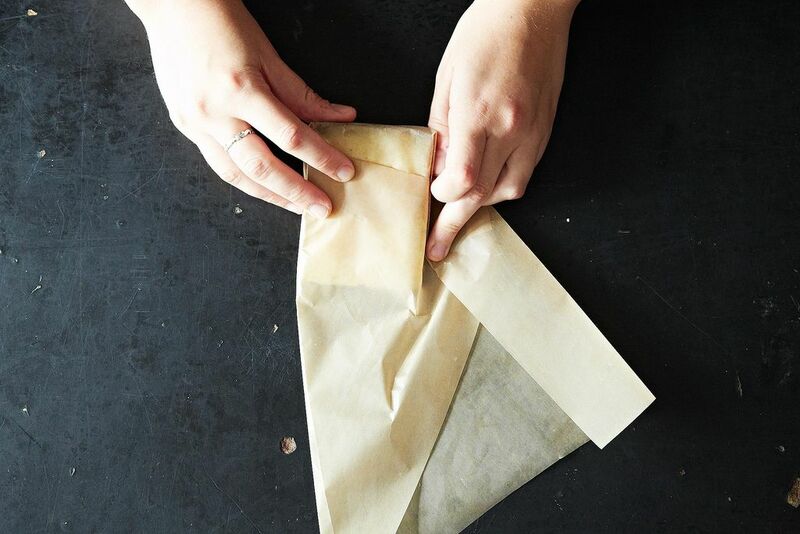 Fold it like at the deli (bring front and back together and fold over to tighten around cheese, pleat each side and tuck under). I don't know this product. It is not available where I live in Mexico, but will be something to put on my US shopping list. And it would be perfect for sealing the plum pudding I am steaming for Christmas, instead of using parchment paper and foil tied over the mold. Thanks for the tip! For fresh, soft cheese that is still very moist, I use a linen dish towel. Of course, this is a treatment for cheese that will not be in the fridge for too long, as it would dry out eventually. But it breathes, maintains a dry surface, and stays fresh until the end. Also, in the procedure for "Soft Cheese", did you mean "change your wrapper every couple of days", instead of "change your cheese"? My mother used always to wrap cheese in the waxy inner of cereal packets. 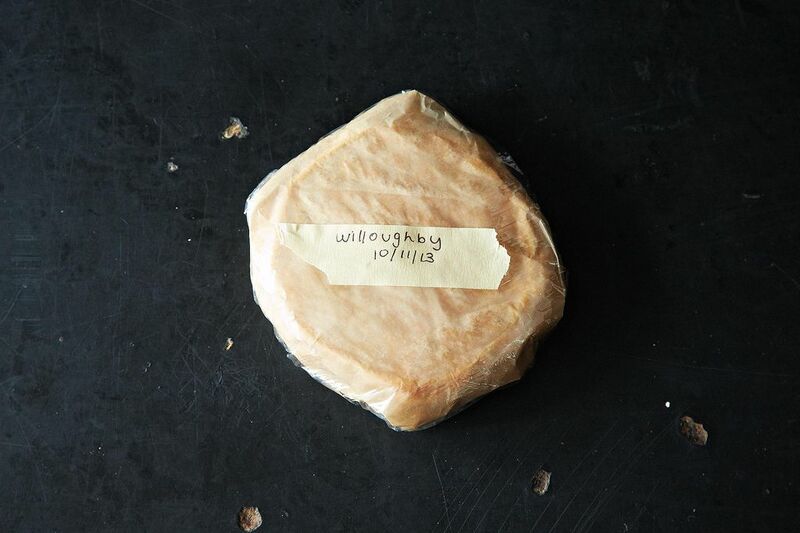 The Cheddar, because it was always Cheddar in those days for us, kept well in our cool, ventilated larder. A wonderful article but constantly tearing off fresh paper seems wasteful to me. Would you be able to achieve a similar effect with a clean linen kitchen towel? I have used parchment, but lately have been using those pop-up dry wax sheets from Costco. I love those sheets and use them for a million things. Could you provide more description, please? what color package/box, in what department, etc? thank you. What a brilliant idea and so well explained. Thank you for making my favorite cheese even better!!!! We put the cheese in the plastic so it doesn't dehydrate too quickly. If you want to keep your pretty wrapping job in sight just loosely wrap it plastic wrap, or eat your cheese within a few days! Seems like if the cheese was paper wrapped and then put into plastic, the benefit of letting the cheese "breathe" is completely lost. I'll stick with wrapping parm in a slightly wet (with rice vinegar) paper towel. Will wax paper work as well? Or just the parchment? 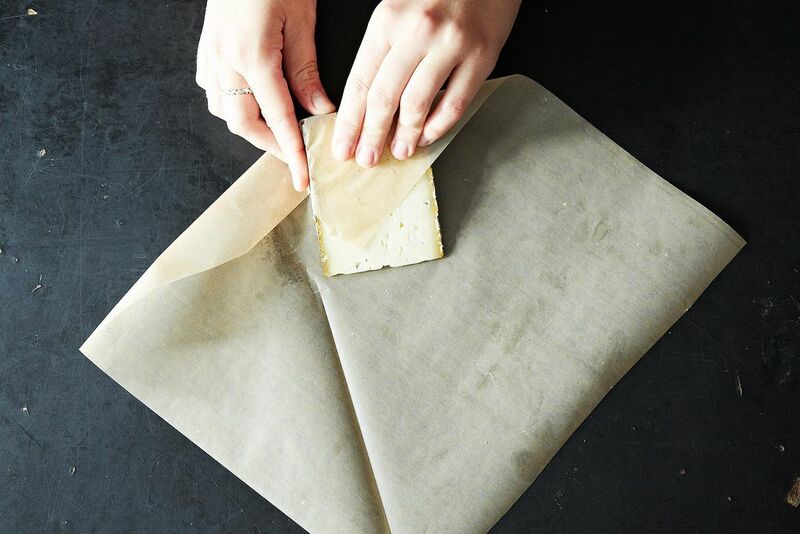 Wax paper will work as well, parchment will just allow the cheese more room to "breathe." If you're worried, just change the paper every couple of days! This is so helpful -- thank you, Catherine!